New Yorkers are known for their ability to negotiate the constant hustle and bustle without breaking their stride in the city that never sleeps, but even they have been stopping lately for an unlikely reason: a visit with Ciro Ortiz, aka “Emotional Advice Kid.” Since October, Ciro has been spending his Sundays in a New York City subway station, doling out advice for $2 a pop. The 11 year-old isn’t pocketing this money, however — he’s paying it forward and donating his earnings to help pay for the lunches or snacks of some of his classmates at school. Encouraged by his parents, who have remarked on Ciro’s uncanny ability to understand and genuinely listen to others from a young age, Ciro sets up his little table and an extra chair and acts as an on-the-go mini therapist. For notoriously stressed city dwellers, Ciro lends a kind and attentive ear and offers a youthful voice of reason. Ciro, who has himself been bullied in the past, channels his natural maturity and gift for speaking with any and everyone in a simple and straightforward way. Like many kids, he is able to see past the complicated lives of adults and try to get his “clients” to see what is most important to them. Kids’ interests come and go, so Emotional Advice Kid‘s time in the bowels of a NYC subway station may be a limited-run. For the dozens of adults who have come to Ciro for suggestions as well as thousands more who have heard of this junior shrink’s cheap and convenient therapy, Ciro reminds us of the enduring power of a listening ear, an open mind, and a simple yet positive life outlook. New Yorkers are known for their ability to negotiate the constant hustle and bustle without breaking their stride in the city that never sleeps, but even they have been stopping lately for an unlikely reason: a visit with Ciro Ortiz, aka "Emotional Advice Kid." 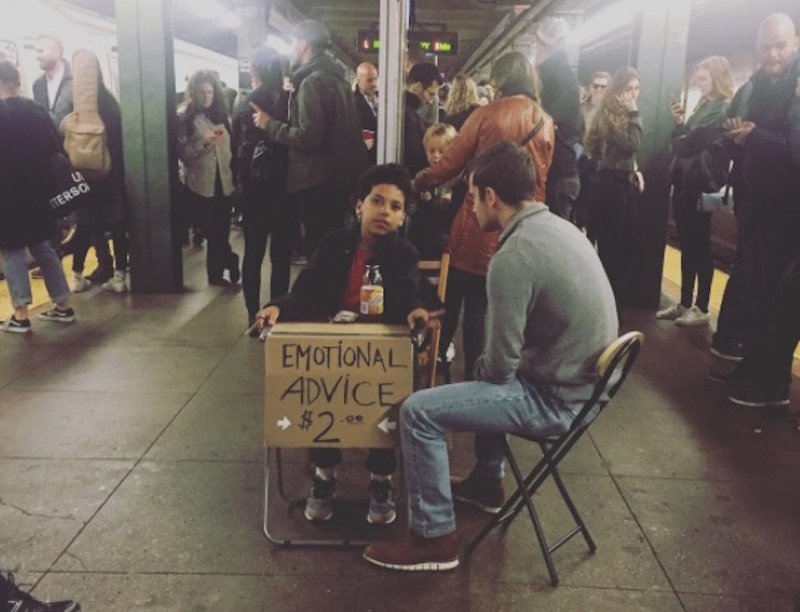 Since October, Ciro has been spending his Sundays in a New York City subway station, doling out�advice for $2 a pop. The 11 year-old isn't pocketing this money, however -- he's paying it forward and donating his earnings to help pay for the lunches or snacks of some of his classmates at school. Encouraged by his parents, who have remarked on Ciro's uncanny ability to understand and genuinely listen to others from a young age, Ciro sets up his little table and an extra chair and acts as an on-the-go mini therapist. For notoriously stressed city dwellers, Ciro lends�a kind and attentive ear and offers a youthful voice of reason. Ciro, who has himself been bullied in the past, channels his natural maturity and gift for speaking with any and everyone in a simple and straightforward way. Like many kids, he is able to see past the complicated lives of adults and try to get his "clients" to see what is most important to them. Kids' interests come and go, so Emotional Advice Kid's time in the bowels of a NYC subway station may be a limited-run. For the dozens of adults who have come to Ciro for suggestions as well as thousands more who have heard of this junior shrink's cheap and convenient therapy, Ciro reminds us of the enduring power of a listening ear, an open mind, and a simple yet positive life outlook.